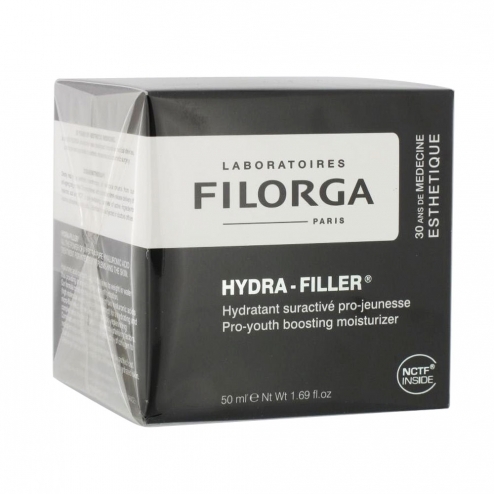 Hydra-Filorga filler can rejuvenate the skin intensely due to the presence of extra-pure hyaluronic acid in its formula. Hyaluronic acid, in addition to having the ability to hold up to 1000 times its weight in water, is a real infusion moisturizing your skin. The formula for this treatment combines the performance of two acids hydaluroniques (+ micro-fragmented high molecular weight) for the effect of hydration and micro-wrinkle fillers. Meanwhile, replenishing its complex helps the skin to regulate its own moisturizing factors. Finally, hyaluronic acid and glycerin NCTF coupled to limit the formation of wrinkles and creases in the dermis boosting collagen production. Your skin is plumped and dehydration lines are smoothed. To apply every morning on the face.